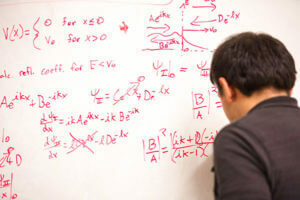 The Physics program at St. Mary’s University offers a Bachelor of Science degree in Applied Physics with options in Engineering and Computer Science. This degree plan that provides an instructional base in physics, engineering, mathematics and computer applications. Graduates are prepared to enter today’s technology based marketplace or pursue advanced degrees in related fields. Along with technical courses, students in the program benefit from liberal arts curriculum which include courses in English, social science, philosophy, theology, speech, foreign languages and the fine arts. Applied physics is a great vehicle for entry into a wide range of positions in both the public and private sectors and is perhaps the best preparation for careers in general technology areas. It is ideally suited for up-and-coming areas, such as energy and nanotechnology. Graduates often pursue advanced degrees in areas such as condensed matter physics, plasma physics, optical physics, high energy physics and biophysics, as well as engineering and computer-related areas.